Bring a charming element to your curbside with the Mayne Charleston Plus Mailbox Post. Placing your mailbox on an elegant post immediately adds curb appeal and design to your home. This 57" tall post accommodates your medium mailbox up to 12 pounds (not included) and a newspaper with ease. Beveled inset panels on each side of the post bring sophistication to the unit, and matching panels on the newspaper holder continue the look. The white color of the item adds a clean look to the unit, and offsets your foliage. Crafted from sturdy polyethylene, this post will not fade, peel, crack, rot, or warp, and is easily maintained by rinsing with a garden hose. Insert a wooden 4 x 4 post (not included) into the mailbox post and anchor it into the ground for stability, then add a mailbox up to 12 pounds (not included). 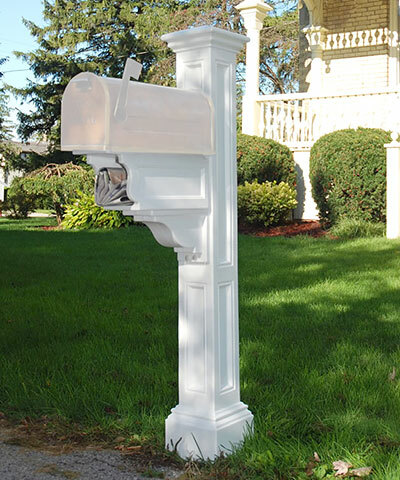 Adorn your yard using this Charleston Plus Mailbox Post. Some assembly required. Made in the USA. Fifteen year limited warranty. Note: This description refers only to the Mayne Charleston Plus Mailbox Post. A mailbox, mounting equipment, and 4 x 4 wooden post are not included.